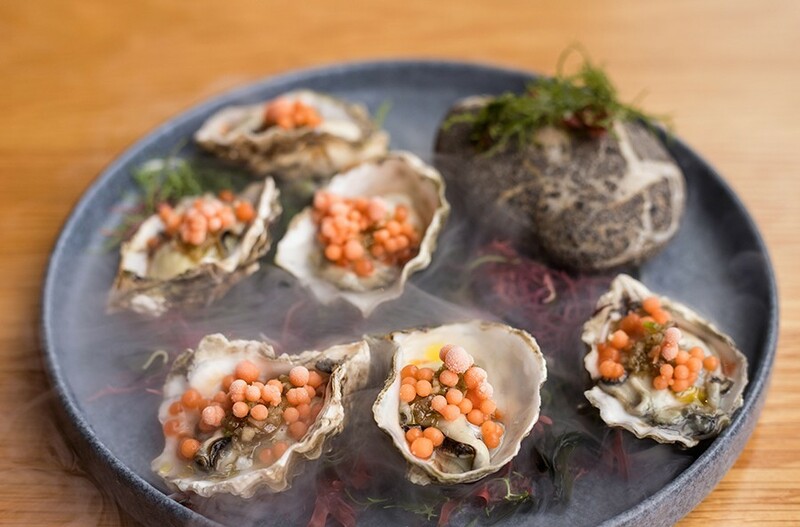 ”Oysters and Pearls,” served in a swirl of liquid nitrogen, are Yellowbelly’s most awe-inspiring dish. 4659 Lindell Boulevard. No phone. 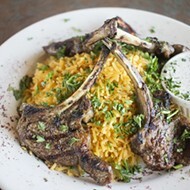 Open daily for dinner; lunch Wednesday through Sunday. Yellowbelly bills itself a sea-inspired affair, a mystique perfectly captured in its "Oysters and Pearls" appetizer. Shrouded in a thick, swirling fog of liquid nitrogen, the oysters appear at the table as if they have been conjured there by a benevolent sea goddess. The cloud slowly lifts, revealing six shimmering Kumamoto oysters. Each is adorned with several pea-sized "pearls" of mouth-puckering cocktail sauce; when the miniature ice spheres pop, they gently melt on the tongue, wrapping the creamy oyster in piquant refreshment. The experience is more enrapturing than a siren song. 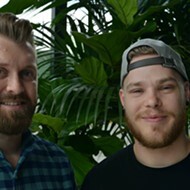 Much has changed for co-owners Travis Howard and Tim Wiggins over the last six years, the least of which might be presiding over a restaurant that serves a whimsical masterpiece like the "Oysters and Pearls." When the pair met around 2012, they were far from the restaurateur and acclaimed bartender that they are today. Back then, Howard was managing Baileys' Range and hired Wiggins, who had almost zero restaurant experience, to do basic support work. Among his jobs? Scooping ice cream. As their work relationship turned into a friendship, Howard confided in Wiggins about his dream to open a restaurant of his own. When those dreams began to morph into reality, Howard asked Wiggins, who was by then a bartender, to help him develop and open the restaurant that would become Retreat Gastropub. The restaurant opened without fanfare in the fall of 2015 — but quickly gained both popular and critical acclaim, becoming a Central West End mainstay. 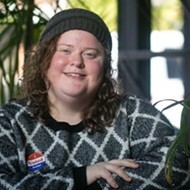 And it wasn't just Howard's vision that made Retreat so successful; the entirely self-taught Wiggins has shot to the top of the city's cocktail scene, garnering national recognition for both his mixology skills and hospitality focus. What a difference three years makes. No longer the new kids on the block, Howard and Wiggins were aware of the high expectations surrounding their sophomore effort, so they took pains to make sure they got it right. Their first step was nailing the concept. Wiggins, who has a passion for rum, had a clear vision of the cocktail menu he wanted to create: a modern rum bar that brought the tiki drinks popularized in the 1960s and '70s into the present day. The key, and something he and Howard had not seen on their research and development trips, was making sure they did not go down a kitschy path paved with grass skirts and ceramic glass heads. Yellowbelly is located in the posh Citizen Park building in the heart of the Central West End. The design element of the space, and the branding, helped set a more modern, stylish tone. Located in the new, ultra-sleek Citizen Park building on the corner of Lindell and Euclid, the restaurant has the feel of a boutique hotel in present-day Waikiki. Floor-to-ceiling glass on two sides of the restaurant fills the open, L-shaped room with light. Industrial metal accents pair with blonde wood, black leather and a shiny, white marble-topped bar to create a modern scene. Alone, these details could provide the canvas for any restaurant. Here, however, they are imbued with a distinctive point of view by prominent features including turquoise tile, a wall-sized mural in shades of blue, white and yellow, and a handful of well-placed plants that evoke palm trees. 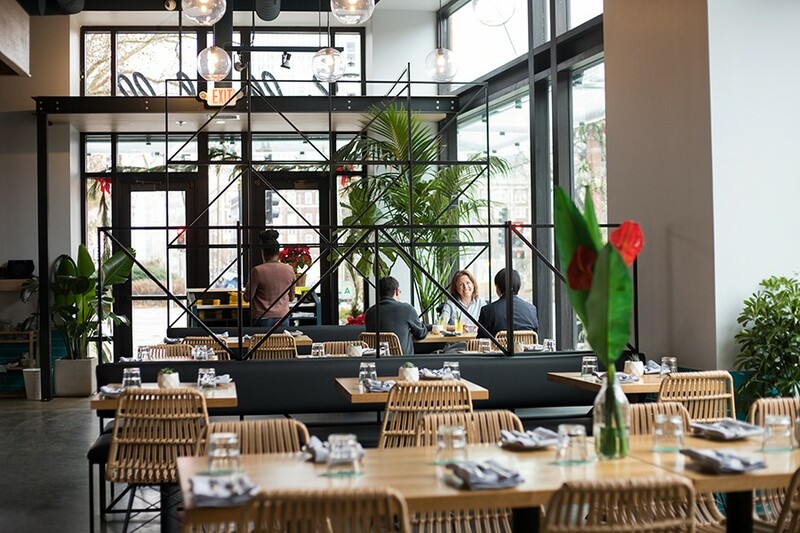 You might call the aesthetic "modern Hawaiian chic," but Yellowbelly is not a Hawaiian restaurant. Instead, it takes the 50th state as a jumping-off point for both its aesthetic and several of its dishes. Tuna poke, for instance, pairs ruby-colored cubes of the raw fish with creamy avocado. Both are tossed in a soy dressing and accented with small slivers of pineapple. The fruit cuts through the meaty fish, wrapping the dish in tropical refreshment. Spam-and-crab-fried rice, offered as a standalone side dish or an accompaniment to some of Yellowbelly's entrees, is another well-executed play on a Hawaiian staple. Hunks of the processed pork and succulent crab meat infuse the moist, well-seasoned rice with salt, sea and fat. A whisper of black pepper warms the back of the throat like this rice warms the soul. 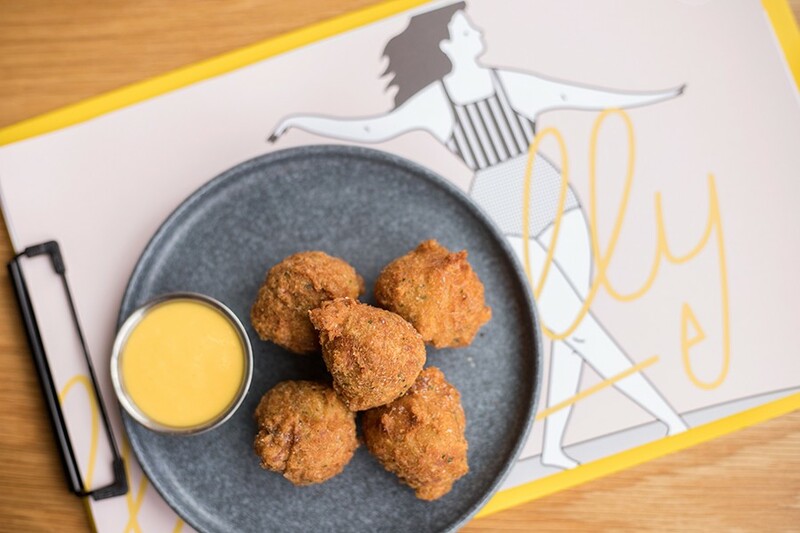 Deviled crab fritters are delightful shellfish puffs, made even more so when dipped into the accompanying passion fruit mustard. Most of Yellowbelly's menu, however, is less about Hawaiian cuisine than seafood in general. Deviled crab fritters present the shellfish suspended in fried, cloud-like poufs. The light-as-air fritters dazzle on their own, but when paired with a tangy passionfruit mustard (think honey mustard on a Pacific getaway), they are otherworldly. A fiery shrimp appetizer, offered off the menu on one visit, proved a highlight. Garlic and flour coat the tender shellfish, which are then pan-fried and soaked in a chile-spiked garlic-butter sauce. I hope it will become a regular offering. Our server described the "Sea Biscuits" as Yellowbelly's take on Red Lobster's beloved "Cheddar Bay" biscuits — a bold statement considering that one of life's guiltiest pleasures is dipping those cheesy wonders in all-you-can-eat scampi butter. Here, they are more complex, enriched with the deep, sea flavor of uni-infused butter. Flecks of green onion add an herbal punch. I can't say they are better than the original, but they are certainly more sophisticated. ”Wu Tang Clams” are served with Portuguese sausage in a white wine broth. 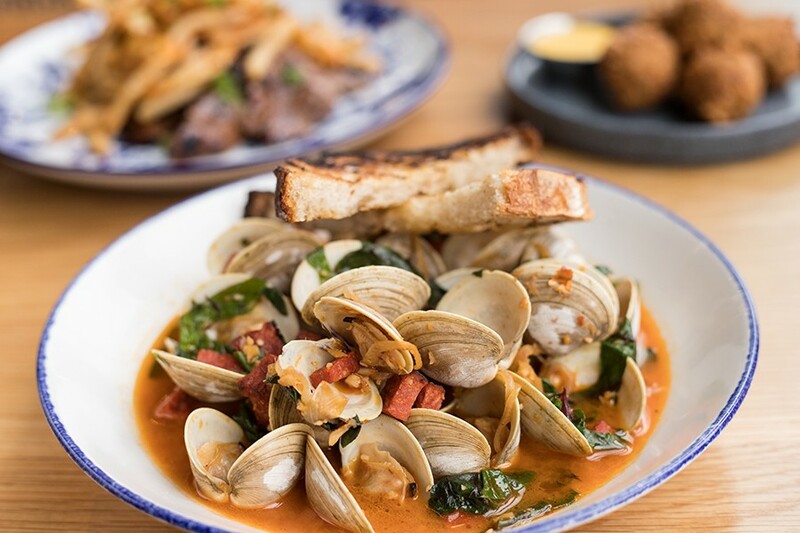 Playfully named "Wu Tang Clams" are prepared in a warm, wine-spiked broth that is light in texture but full of rich shellfish flavor. 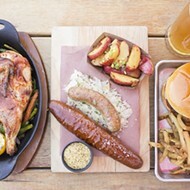 Portuguese sausage adds notes of garlic and spice. The kitchen proves adept at cioppino as well; this Thai-influenced version of the seafood stew has a tangy, tomato base up front that softens into sweet, coconut milk richness. Tender shellfish bobs in the rich, though slightly salty, nectar. The one miss on the seafood front were the octopus tacos. The meat was tender but had a fishy taste that was exacerbated by spicy harissa sauce and chorizo. The fish sandwich, a generous portion of battered white fish served on brioche, is a far superior offering. Pickled daikon and crispy cabbage slaw top the buttery, fried fish, offering a refreshing counter to the searing hot filet. Yellowbelly proves equally skilled at its non-seafood offerings. As if the thick, well-seasoned beef patty that makes up the "Big Kahuna Burger" isn't enough, the kitchen tops it with a slab of pork belly. The fat from the pork renders over the burger, forming a decadent glaze that is mercifully cut with vinegary sweet pickles. Meanwhile, a skirt steak marinated in a sugar, soy and garlic-forward Korean barbecue sauce is as outstanding as the restaurant's best fish dishes. I can't decide which is a better use of that delectable marinade — as a glaze for the meat that forms a sweet-and-salty crust when grilled, or as a dipping sauce for the accompanying beef-fat French fries after it mixes with the steak's juices and pools on the plate. Both are magnificent. 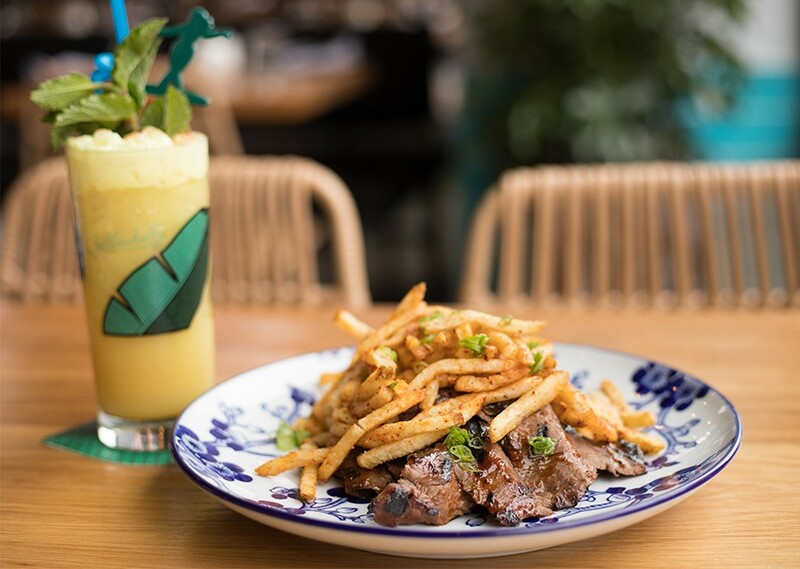 The Korean barbecue-glazed steak shows Yellowbelly’s comfort with its non-seafood offerings. The fries can be ordered as a side dish, though if you prefer something green, the Brussels sprouts are a worthy choice. The charred green spheres, accented with crispy bits of pork belly, have a complex, funky undertone that tastes like fish sauce and five spice. I preferred them to the charred carrots. Something about the mix of the blackened veggies, the chimichurri and eel sauce gave the dish an acerbic taste. The chicken wings, another off-the-menu special, erased that unpleasantness. The chicken is coated in a thick, black-peppery breading that soaks in the sweet, garlic glaze. 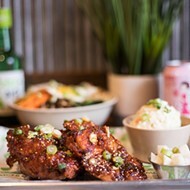 Several years ago, a now-shuttered Vietnamese restaurant called Mi Linh was serving some of the best chicken wings in town. These evoke their glory. Much credit for the food side of Yellowbelly goes to Richard Blais, a celebrity chef who brings with him the renown of Top Chef and, more importantly to Howard and Wiggins, the experience working with seafood that they needed for the restaurant. 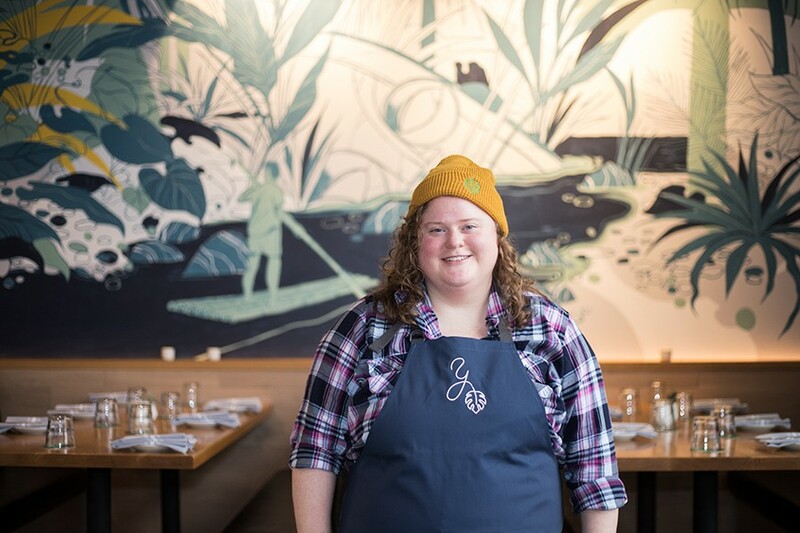 Blais, who spends most of his time in California, developed the menu and is in regular contact with the team; his longtime collaborator, chef Kate Wagoner, runs the restaurant's kitchen. 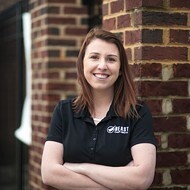 Chef de cuisine Kate Waggoner brings to life chef Richard Blais' culinary vision for Yellowbelly. However, the real star of Yellowbelly is Wiggins, whose beautiful, modern tiki cocktails anchor the concept. Divided into two main categories, "Old School" and "New School," the menu includes world-class renditions of such quintessential rum-based concoctions as a "Painkiller" or a daiquiri, while putting a contemporary spin on the spirit with cocktails like the "Yellowbelly." The restaurant's namesake drink dazzles, a refreshing blend of rums, coconut, pineapple and lime juice spiked with turmeric and spicy ginger. You'll be pleased with Yellowbelly's food; you'll be blown away by its drinks. The only thing more thrilling than one of Wiggins' cocktails is having one paired with those "Oysters and Pearls." And that's exactly what Howard and Wiggins have had in mind ever since they teamed up to open Retreat. Their philosophy — to offer the best food in a bar, or the best bar in a restaurant — means you don't have to choose. And a good thing, too: With options this thrilling, how could you?